Purana Quila is roughly rectangular in shape having a circuit of nearly two kilometers. 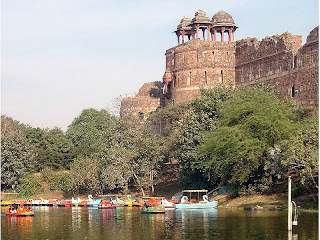 Purana Qila is the oldest known structure of any type in Delhi. Fort was called as the inner citadel of the city of Dina-panah during Humayun's rule who renovated it in 1533 and completed five years later. He added several more structures in the complex during his five-year reign until his death in 1545. Researchers have confirm that uptill 1913, a village called Indrapat existed with in the fort walls. Excavations carried out by Archaeological Survey of India (ASI) at Purana Quila in 1954-55 (trial trenches) and again 1969 to 1973 by its Director, B B Lal have unearthed Painted Grey Ware dating 1000 B.C., and with a continuous cultural sequence from Mauryan to Mughal through Sunga, Kushana, Gupta, Rajput and Sultanate periods, confirming the antiquity of the fort. The ASI has so far discovered a rare 12th century sculpture of Vishnu, terracotta seals from the Gupta period, pottery from the Kushan and Gupta periods, structures from the Rajput and Kushan periods, copper coins, terracotta human figurines, charred wheat and rice grains and many more remains from the Mauryan period. Opened after a span of 40 years, the Archaeological Survey of India has carried out an excavation here since February this year -- to identify the presence of Painted Grey Ware which if found, would establish the site's link to Indraprastha, the legendary capital of the Pandavas in the Mahabharata, and therefore link it to other sites of the Mahabharata. Vasant Swarnakar, ASI's Delhi circle chief said that "in earlier excavations, Painted Grey Ware was not found. It has been archaeologically proven that if it is a Mahabharata site then Painted Grey Ware should be found; we have started with the hope of finding this ware". According to media reports the public will be allowed to observe how archaeologists dig out terracotta figurines of Kushana, Gupta and Sunga periods, copper coins of the Maurya period and antiquities of the Sultanat period. This is the first time that an excavation site has been opened to the public while work is still going on. The ASI will eventually turn this site into an open museum, which will be covered with glass, and people will actually be able to walk over it. Purana Qila is on Mathura Road. The old Delhi Agra highway. Purana Qila has a zoo inside the fort. The Delhi zoo. Delhi also has Ashoka hotel (near PM's official residence). I feel the per day rent of all the rooms may be considered equivalent to one day rent of PM's bungalow. Delhi also has Buddha Garden reminding us of Ashoka who converted to Buddhism to stop killing. The best building is Qutab Minar. Qutabuddin started and Altmash built structure. Birla Mandir is also worth a visit to bow there. This is interesting. It will be good if they find some link but I don't think it is necessary to prove that epics actually happened. I am not sure if they have determined the period when Mahabharata might have taken place.